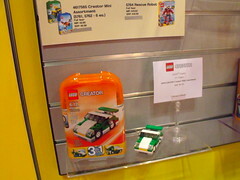 Since our sites' normal coverage doesn't extend outside the constraction themes, we reached an agreement with Eurobricks to share with them our coverage of the LEGO Collectors Preview and all the sets and themes on display. Part seven of our coverage are the themes Creator, Racers, and Games, each of which continues to have a presence in the 2012 lineup. There's not much to say about a mini-model like this, except that I like the A model best. The "super go-cart" and flatbed truck seem to struggle a bit more in making do with the sports car's parts. 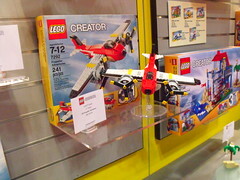 This set's models (a fire engine, fire chief's off-roader, and firefighting helicopter) all look impressive. If I had to choose between this year's two mini-models, I'd go for this one. This jet is very attractive, although not as appealing as some of the larger supersonic jets in previous years. The functional landing gear is a plus. 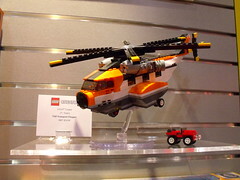 Its B and C models, a speedboat and a helicopter, are not nearly as streamlined, but they make good use of the A model's parts. 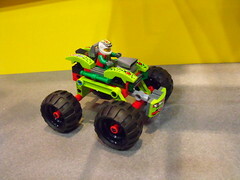 No matter how many street cars appear in the LEGO Creator theme, the designers always seem able to come up with new and imaginative B and C models, in this case an off-roader and a vintage race car. The opening doors and medium blue details are also great assets of this set. The color layering of these dinosaurs (a T-Rex, a pterodactyl, and a brachiosaurus) is obviously more chaotic than the sleek, streamlined look of this year's vehicle-based sets, and the proportions of all three models leave something to be desired. The set's main assets are its dark red parts and many teeth/claws. I'm quite impressed that three very unique-looking motorcycles (a street bike, a chopper, and a moped) could all be built with the same pieces. All three have working steering, but only the first offers working suspension. 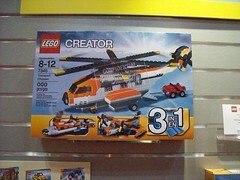 This is by far the most Technic-intensive Creator set for the year. This set's three models put the aforementioned Super Soarer in its place. The sleek but bulky twin-prop plane is brilliant even ignoring the movable landing gear, but the fighter jet and hovercraft you can also build from these parts are also impressive in their own right. This colorful and streamlined helicopter can be rebuilt into a somewhat less streamlined transport boat or seaplane. But as far as I can tell the colors are well-arranged on all three models, even if none has the awesome diagonal stripe created by the slope bricks on the side of the A model. 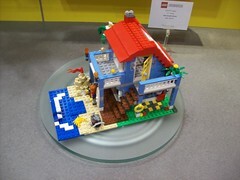 The Creator houses are fairly popular with AFOLs, largely due to being minifigure-scale. This Seaside House has a unique color scheme, although I know some people are frustrated with bright red roofs. 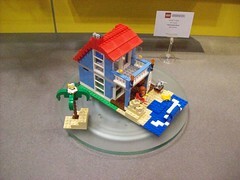 Like last year's Creator houses, this set uses basic plates rather than specialized baseplates, which here allows for a gradual shoreline that is rearranged in the B and C models, a beach townhouse and beach cottage. This set contains two light bricks to activate the lights on top, with a convenient and inconspicuous button that activates both at once. It's a very well-designed function. The stripe pattern on the hood/bonnet reminds me of the old Model Team sets. 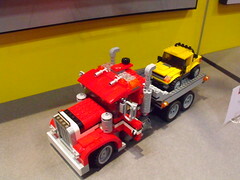 The set can be rebuilt into a convertible or a crane truck, both of which are just as snazzy-looking as the A model. 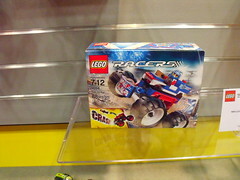 This year's Racers sets all have a "crash" function-- pressing the front bumper makes the minifigure driver pop out. 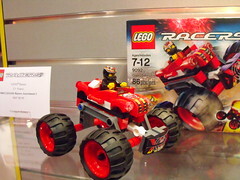 In this way, they are reminiscent of the first Racers sets, although these sacrifice the strange slammer-containers of those sets, instead offering traditional minifigures and actual building complexity. 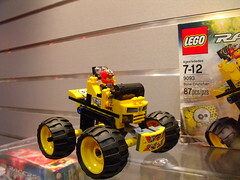 A Devon Daredevil minifigure is included. As you can see, the structure of these Racers sets is somewhat repetitive, although of course the nature of their function means you would want them to be evenly-matched. Each driver has unique helmet and torso prints, although the faces are from various earlier sets. 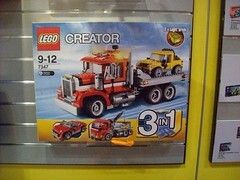 This set's driver is named Motor Mike. The box pic here shows off the crash function. The reason for the inflated price-per-piece of these sets is probably their oversized wheels and tires. 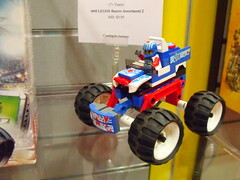 This set includes the driver minifigure Captain Stunt. The exciting, graphic-covered race uniforms remind me of some Race sets from the 90s as well as the 2002 Drome Racers sets. Naturally, these Racers sets aren't extremely realistic monster trucks—after all, what monster truck would fling its driver into danger upon crashing? But Racers has never had a track record for realism, except perhaps in its licensed sets. 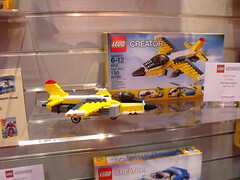 This set's bright yellowish-green parts and even stickers might be desirable for Ninjago builders. 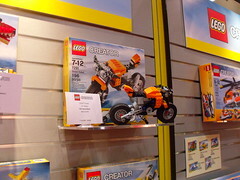 Includes the driver minifigure Nitro Nick. This game had a March release date, and I have in fact seen it in stores since a few weeks after attending Toy Fair. 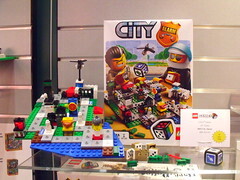 This "Cops and Robbers" game pits two players (or, in its four-player version, two teams) against each other in an amusing microscale version of LEGO City. 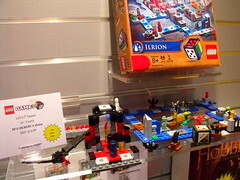 This game, the latest installment of the Heroica theme, is due for release in August. Microfigs include three zombies, the Vampire Lord, and the imprisoned King along with three heroes. Four bats and a fearsome giant bat also are involved in gameplay. 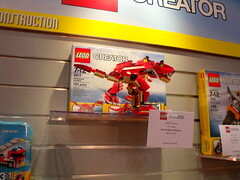 This set was a real mystery-- it was not mentioned in the press kit we received as attendees, and as you can see the name card gives no information besides its name, year of release (2012), and recommended age (6+). Not even a set number! 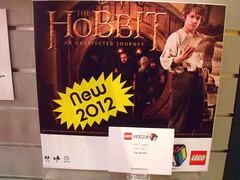 Chances are that it will be released in Fall 2012 (Spring 2012 for those of you in the southern hemisphere), the release date mentioned various places for upcoming sets based on the film The Hobbit: An Unexpected Journey. That wraps it up for part seven! In part eight, we'll be covering the much-loved LEGO Star Wars theme. Stay tuned! Thanks for posting these! 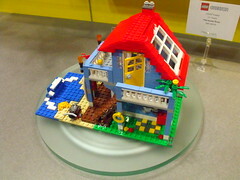 I think I want the Seaside House, but I still keep thinking the price is a mistake. 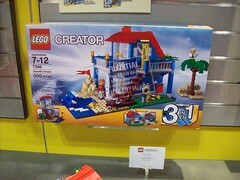 Creator houses usually have a much better price per piece; even the ones with electronic parts come in under 10 cents. Is it possible the quoted price was a misprint? Maybe the piece count is not accurate. Perhaps it is more than 415 pieces? Either way, one of the 2 doesn't seem right, price or the piece count. Since the price is on the tag in the pics but the piece count is not on the box, I'd guess maybe the piece count is not updated.